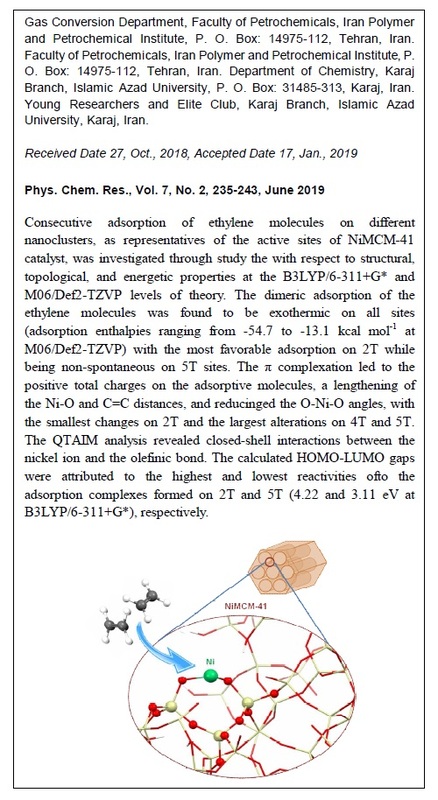 Consecutive adsorption of ethylene molecules on different nanoclusters as representatives of the active sites of NiMCM-41 catalyst was investigated with respect to structural, topological, and energetic properties at the B3LYP/6-311+G* and M06/Def2-TZVP levels of theory. 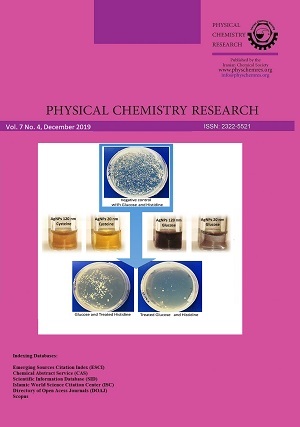 The dimeric adsorption of the ethylene molecules was found to be exothermic on all sites (adsorption enthalpies ranging from –54.7 to –13.1 kcal/mol at M06/Def2-TZVP) with the most favorable adsorption on 2T while being non-spontaneous on 5T sites. The π complexation led to positive total charges on the adsorptive molecules, a lengthening of the Ni–O and C=C distances, and reduced O–Ni–O angles, with the smallest changes on 2T and the largest alterations on 4T and 5T. The QTAIM analysis revealed closed-shell interactions between the nickel ion and the olefinic bond. The calculated HOMO–LUMO gaps attributed the highest and lowest reactivities to the adsorption complexes formed on 2T and 5T (4.22 and 3.11 eV at B3LYP/6-311+G*), respectively. The presented results underscored the importance of a systematic study of the adsorption steps on different active sites of transition metal catalysts.